I am preparing for B going to daycare (noooooo) and so I picked up some new Born Free bottles that were on sale. 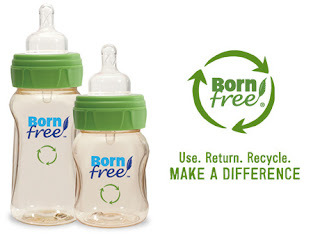 Our current Born Free bottle is glass but we decided to get plastic so we could covert them into sippy cups in the near future (instead of having to purchase separate sippy cups). One thing that I found very interesting is that when you are done with your Born Free bottles you can send them back to the company and they will recycle them into other materials. US Program Canadian Program *UPDATE - looks like Born Free no longer has a recycling program. In Canada they are going one step further and for every bottle that is returned they will make a donation to Tree Canada. I got them at Babies R Us. We have a glass one that we converted into a sippy cup. There is just one problem with it; I like C's sippy cup to be mostly spill proof - this one is not. If he holds it upside down the juice or milk leaks out also if he shakes it well - it just gets everywhere. That being said, we still use it as a inside the house sippy cup. Also when we bought our bottles over 2 years ago now Born Free was the only company that made bpa free bottles - one of the main reasons we chose them. So despite the fact they do not make the best sippy cup they 2 thumbs up from us for paving the way to less toxic baby bottles. Good to know that they are a bit leaky.